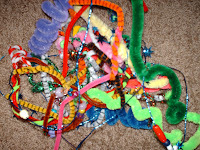 I think it is time for me to explain the title of this blog - Pipecleaner Dreams. Ashley is an artist. With a few pipecleaners, some wire, and some beads, she creates sculptures. These sculptures are always very colorful and unique, and in fact, change from day to day - sometimes hour to hour. They can get very large, and they must always go everywhere she goes. One never knows when another interesting object might appear and be destined for the sculpture! Because she has to take it everywhere she goes, people assume it is a comfort object - like a 'blankie' maybe. But I think it is more than that. Ashley is and always has been a child with an active mind. Yes, she is diagnosed with ADHD and active is an understatement, but you can always see the 'wheels' moving just behind her eyes. It seems as if she is always thinking something, and thinking very quickly. You can tell when she communicates through sign language sometimes - she will get ahead of herself and it is difficult to follow what she is trying to say. The only time her mind seems at rest is when she is sleeping, but is it really at rest. I wonder if she is dreaming about pipecleaners even then! So, this blog is dedicated to my mind-active child. Her strong will and creative problem solving skills are the forces that are propelling her through life, and she is having so much fun along the way. The pipecleaner sculptures are evidence of that. Everyone just looks at them and smiles! In fact, when Ashley presented her pediatrician with a framed sculpture of his own in honor of his retirement, he was touched beyond words. Ashley and her creations continue to touch lives in very profound ways. Ashley sounds so incredibly precious and beautiful. I wish that I would have the privilege to meet this young woman. Your tributes to your daughter goes to show how solid your relationship is with your children and what a fabulous mother you are. Allie, I noticed from your profile that you are in Canada. It's interesting that in Canada, support for people who are deafblind is much more advanced than in the United States. Canada has had people called 'intervenors' for years - people who become the eyes and ears for the deafblind. 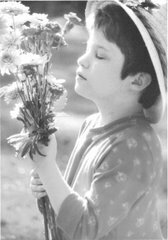 In my school district in Virginia, it is an ongoing fight to get someone to perform that function for Ashley in school. I have been successful in finding someone to help out after school, but the school division fights very hard to keep those services from her. I think they just don't understand. One would think my biggest stresses and battles come from medical issues for Ashley. But, they don't. They come from fighting for appropriate school services. It is so sad isn't it? Yes - up here in Canada (or in Alberta and BC that I know of), our schools provide tremendous support for children with perceived disabilities. I actually have many friends who work as a support person to children throughout their schooling years. I just can't imagine the frustrations and anger that you must face on a daily basis. Ashley truly sounds very special and has a wealth of talent. It is a shame that the lack of knowledge or initiatives from her school system in the long run could possibly hold her back. Every child no matter their perceived abilities should have the encouragement to reach their dreams and have opportunities made available to them. Actually, my parents had to struggle so much to get my sister help. Doctors and teachers wanted to treat her as if she was profoundly deaf, and she isn't. It took nearly 12 years just to get a correct diagnosis here. And we live in Canada. So I'm not sure about this advanced support. But I would so love to meet Ashley. She sounds so beautiful and positive. Something my sister and I both love dearly is art. I'd love to get my sister more interested in creating stuff like Ashley does. Ashley sounds like an incredible person. Marla talked about this very cool sculpture in her blog today. I think it is very beautiful and I now understand why it is "extra special" to Marla and Maizie. What a joy it was to find you blog today. Ashley sounds like a young lady who knows what she wants and creates it. I look forward to reading more. Stopping by through 5MFSN and I'm glad I did. My husband had severe ADHD as a child. His poor mom. If her stories and the stories of the rest of their family are true, he was quite a handful to say the least. He still has ADHD but has learned to control and deal with it. He amazes me. I like what you said that her creative mind will 'propel' her through life. That is so true. My husband finds creative solutions to everything. He has literally 'propeled' through positions at two different companies until he is a high as he can go because upper management is always so impressed with his ability to look at a problem in a way no one else was able - and then come up with a solution that no one else could have thought up. Your daughter will propel through life, especially with a mother who loves and understands and encourages her the way you do. Wow i loved your story, thank you so much for sharing that! What a special little girl you have! So glad that I found your blog. I love your story. Hope you will come by and visit me. Pleased to meet you, I second what Allie said, I too am Canadian and I have a daughter who is ADHD, now a young woman of 21, school was challenging by times but they always seemed to find a resource each year to help Jaclyn. They were more than accomidating. Love your blog, glad I stopped by from the UBP '09. It's so wonderful to meet new people. Enjoy the rest of the party and stop by if you get a chance! Awesome intro and fabu reason for the title of your blog. I have two children with ADHD (two different types). I'm blog hopping via the Ultimate Blog Party. Nice to meet you. How beautiful! Party hopping here and participating too so stop in for a visit. I would love to see more of Ashley's sculptures. I am here visiting from UBP2009. Nice blog. Stopping by from the UBP!! Hope you are having fun!! Come on over and say HI!! We are having some fun giveaways going on at our blog!! Hi, I've come over as part of the UBP. I have a toddler learning/fun site at www.superfunmama.blogspot.com. Very nice to meet you and your blog. I am giving away Pink Champagne Shower Syrup from Jaqua Beauty...stop on over and enter! Ends April 8. US Only. how sweet that she made the pediatrician a piece of artwork! I can relate to Ashley's reason for taking her sculptures with her. It's why I carry several pads of paper wherever I go (and when I was Ashley's age, it was twist tye people). I never know when inspiration will hit, and I hate to let it pass unexpressed.